Note: This blog post has been changed to match E2B v1.92f and later versions of E2B! v1.92f is now even easier to use than v1.92e! For updated details, go to the Easy2Boot website page here. As you may know, if you have not encrypted your Windows OS with BitLocker, it is quite easy to get into your OS by using the trick of replacing UtilMan.exe and\or SetHC.exe with Cmd.exe. Once you have done this, you can hit WINKEY+U or press the SHIFT key five times to bring up a Windows cmd shell box with full admin rights! You can then create a new Admin account and log into Windows. This is especially useful if you have a system handed in for repair and the client does not know or remember any of the Admin account passwords. To semi-automate this process and save some typing, E2B v1.92e now contains a new \_ISO\docs\utilman folder which contains four .cmd script files. v1.92c has a few, very small changes and also a new file has been added - \_ISO\PimpMyDrive.cmd. This script must be run from the E2B drive. It copies a selection of Sample mnu files to the \_ISO\MAINMENU\PIMP folder. Note that the Change Theme menu requires the current \_ISO\MyE2B.cfg file to be overwritten - so take a backup of the MyE2B.cfg file first (the script will take one backup for you)! The extra menu items that are added can be see in the screenshot above menu items #1 to #21. Some years ago I developed a .hta script in VBScript to collect system information. This was used on thousands of systems by field engineers and customers alike, so that they could quickly send a report back to the office techs for further diagnosis and investigation. You can run SysInfo file on any Windows system that allows .hta files and VBScript to run. If you download and unzip it, make sure Properties - UnBlock is ticked or Windows may prevent you from running it. I have slightly revised it now for Windows 8 and 10 and also tweaked the email facility so that you can send the report, using your gmail account, to yourself or to someone else. You can easily modify it to display your own company name in a heading, etc. If you tick the RMPrepUSB option Boot as HDD (C: 2PTNS) then RMPartUSB will create a second 31.5KB partition at the end of the drive. 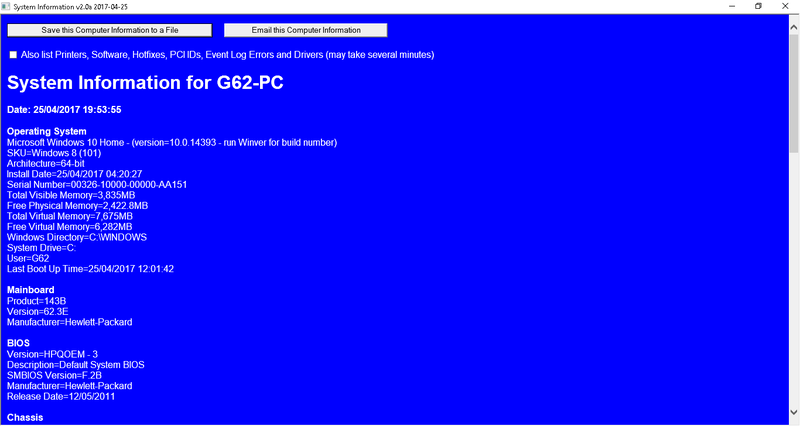 The type is 21hex which no previous Windows OS has ever recognised... until now! This 2nd partition is only present because some BIOSes will boot a single-partition Removable USB drive as a floppy disk instead of a 'hard disk' and thus you just get a 'black screen - flashing cursor' when you try to boot from the drive. The presence of a 2nd primary partition ensures that even these BIOSes will boot from the Removable USB drive as a 'hard disk' hd0 instead of fd0. Under all previous versions of Windows, this 2nd partition was not detected by Windows and was not given a drive letter. However, in recent versions of Windows 10, Microsoft has changed the way Windows detects primary partitions on Removable drives such as Flash Memory devices (and without actually telling anyone!). Now we can have multiple partitions on USB flash drives - we can even boot WindowsToGo 10 Creator version from a flat-file (non-VHD) Removable flash drive now! The means that now, if you use RMPrepUSB or RMPartUSB to format a drive with the Boot as HDD option ticked, the new Windows 10 will now 'see' the 2nd partition as an unformatted volume and prompt the user to format it! v2.1.737 now formats the 2nd partition as a small FAT12 volume. Windows will give it a drive letter and you can even store files on it (though it is only 11.5KB in size after formatting!). Note that if you connect the same USB drive to a pre-Windows 10 Creator version of Windows, you will not see the 2nd partition though! I found a problem in that RMPartUSB would get confused because it would see two drive letters after partitioning the drive and sometimes chose the wrong drive letter to format as NTFS. v2.1.738 now fixes this (it ignores the small partition). Please report any issues ASAP. E2B v1.92b BETA is now available from OneDrive here. An E2B user contacted me to say that XP installs from ISO did not detect his internal hard disk on his HP G62 AMD notebook. I bought a G62 notebook from eBay, found the issue and fixed it. If anyone in the UK wants a silver HP G62-a17SA, Win 10 Home 64-bit, AMD Athlon II P320 2.10GHz, 320 GB 7,200 rpm HDD, 4GB RAM, HDMI, Enet, webcam, WiFi, DVD R/W, USB 2.0 x 3, good battery, with WPS Office, very nice and clean, very few scuffs (looks almost unused), for £150 ono - let me know! You can update your current E2B DPMS USB drives using this new Beta version. The next BETA will include the latest version of grub4dos which hopefully has all the niggly bugs fixed now. Windows 7 does not contain USB 3.0 drivers, so when you boot from a USB drive from USB 3.0 port, Windows Setup will not be able to access the USB drive and you will get a 'Missing CD\DVD drive device driver' message box. However, by combining a Windows 10 boot.wim with Windows 7 install.wim, it is possible to install Windows 7 from a USB drive connected to a modern USB 2.0 or 3.0 port. I have written a short 'Tutorial #139' describing how to do it. This method means that all types of USB controllers should work (as Win10 contains USB 3.0 drivers) and you don't have to mess about adding USB drivers to the Windows 7 boot.wim file. However, you will have to add the USB 3 drivers to the Windows 7 OS once you have booted to Windows 7, but by then you should have web access and can download them (if available). Otherwise, you can always boot to the Win10 boot.wim and use XCOPY to copy the driver folder from your USB drive onto the Win7 hard disk. 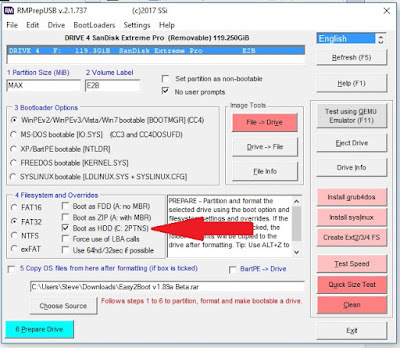 You can use the same Win7+Win10 procedure to modify an ISO and add it to E2B, or you can use MakePartImage to convert a working USB Flash drive to a .imgPTN file and add that to E2B. The systemrescuecd-x86-4.9.6.iso has been updated recently. Description: SystemRescueCd is a Linux system rescue disk available as a bootable CD-ROM or USB stick for administrating or repairing your system and data after a crash. It aims to provide an easy way to carry out admin tasks on your computer, such as creating and editing the hard disk partitions. It comes with a lot of Linux system utilities such as GParted, fsarchiver, filesystem tools and basic tools (editors, midnight commander, network tools). 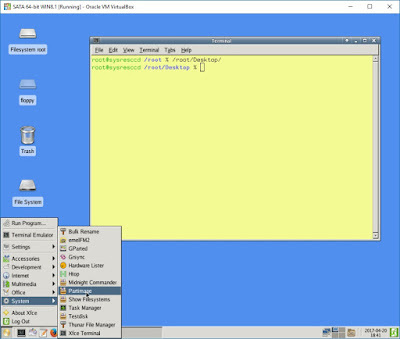 It can be used for both Linux and windows computers, and on desktops as well as servers. This rescue system requires no installation as it can be booted from a CD/DVD drive or USB stick, but it can be installed on the hard disk if you wish. The kernel supports all important file systems (ext3/ext4, xfs, btrfs, reiserfs, jfs, vfat, ntfs), as well as network filesystems such as Samba and NFS. If you add it to E2B it will 'just work'. If you want to use the persistence feature ('backstore'), refer to my previous blog post here. 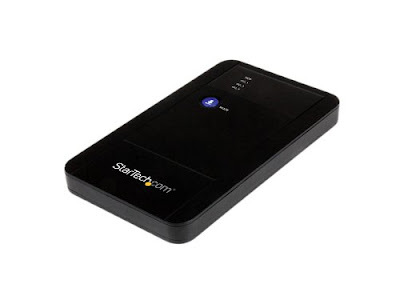 The StarTech S2510BU3ISO Hard Disk enclosure is similar to the Zalman and IODD enclosures in that it can emulate a USB DVD drive by loading an ISO file. Note: This product is now discontinued by StarTech and so is unsupported and has bugs (read-on for more details and a workaround for the buggy firmware). then press again for ISO2 then again for ISO3 and then back to HDD. See my blog page here to find out. 'Ruffian' has sent me the language files for the Ukrainian language and this has been added into v1.92a which is available on OneDrive. \_ISO\docs\Sample mnu Files folder on the E2B USB drive and read the instructions at the top of the file. You will need to change the name of the ISO in the title line and a line below the title line. You will need to create a ext2\3\4 persistence file (ext3 recommended as ext2 files are easily corrupted) using RMPrepUSB. The sample menu provided in the E2B \_ISO\docs\Sample Mnu Files folder for Fedora+persistence only works if you have a FAT32 E2B USB drive - Fedora does not like NTFS volumes when 'flat-file' booting (and it's only the year 2017!). Here is a way to add Fedora+persistence to an NTFS E2B USB drive (MBR and UEFI). I did not notice that the latest grub4dos causes E2B to display a 'WARNING: gub4dos 0.4.5' message to appear as soon as E2B starts to load. P.S. There are also usb driver bugs in v1.91 new grub4dos, so please use v1.91B which has the old grub4dos! It is available on the OneDrive Alternate Download Area and soon on the E2B website. Unfortunately, Google Drive seems to have taken a dislike of E2B v1.91 and 1.91A. As soon as I upload it, it blocks it (marks it with a flag icon). I am not sure why! Even if I zip it up with a password-encrypted zip file, Google Drive still blocks it. Grrrr. P.S. If you are on the Developer's Insider Preview programme for Win10, note that recent developer versions of Win 10 actually break RMPartUSB and Rufus (format fails)! If you have tried v1.91A and had no problems - please tick the 'funny' Reactions box below. Clear Linux is provided as a UEFI-bootable only image. Clear Linux OS for Intel Architecture is focused on the Cloud. Our aim was not to make yet another general-purpose Linux distribution; sometimes lean-and-fast is better than big-and-universal. There is a Live version and an Installer version (see here) provided as compressed xxxx.img.xz download files. Inside each xxxx.img.xz file is a larger .img file (e.g. clear-1440-installer.img). You will need to extract this .img file (e.g. using 7Zip). Here is how to add these to your E2B drive so we can UEFI-boot (MBR-booting is not supported). I have two ageing relatives (one over 80 and the other is nearly 100) and I wanted to set up a notebook for each of them where I could use Skype and video-conferencing to chat with them and help them with such things as email, internet banking, internet shopping, etc. Neither of them know how to use a computer or a smart phone, but these days you really need to use the internet for pretty much everything. It is a shame that the aged and infirm are the ones that would benefit the most from the internet, and yet they are the ones that are excluded from it because, as the saying goes, 'you can't teach an old dog new tricks'. This 1.91g BETA has a new version of grub4dos at \grldr. Let me know if you find any problems. To confirm that a particular problem is caused by the new version of grub4dos, simply use a \grldr file from an earlier version of E2B. Note: As much as possible, E2B does not rely on new features. This means that older versions of grub4dos can be still used (e.g. 4.0.5c) which is useful for regression testing, etc. Another small change is that the SCROLL LOCK = ON state will now always force the auto-suggest prompt to be displayed (even if running a xxxx.isodefault file). Also, SCROLL LOCK will always be turned off whenever QRUN.g4b is run. This is because if SCROLL LOCK is on when isolinux/syslinux runs, it boots to the command shell instead of the isolinux/syslinux menu. Please report any problems or queries. Windows 10 Creators Edition brings major change for Removable USB drives! As recently mentioned by Akeo (Rufus author) on reboot.pro here, The new Windows 10 Creators Edition seems to have changed the way it handles Removable USB drives! Previously, Windows XP/7/8/10 would only mount one partition on a Removable USB drive. However, now it seems to treat a Removable USB drive almost the same as a Fixed-Disk drive and you can assign drive letters to multiple partitions (if they exist) on a Removable USB drive! This is a big change, so this may well cause problems with all sorts of USB-friendly apps! All versions of Easy2Boot produced for over a year now, have contained some embedded code which will check the BIOS date. If the BIOS date is more than 30 days from today, then certain functions (e.g. 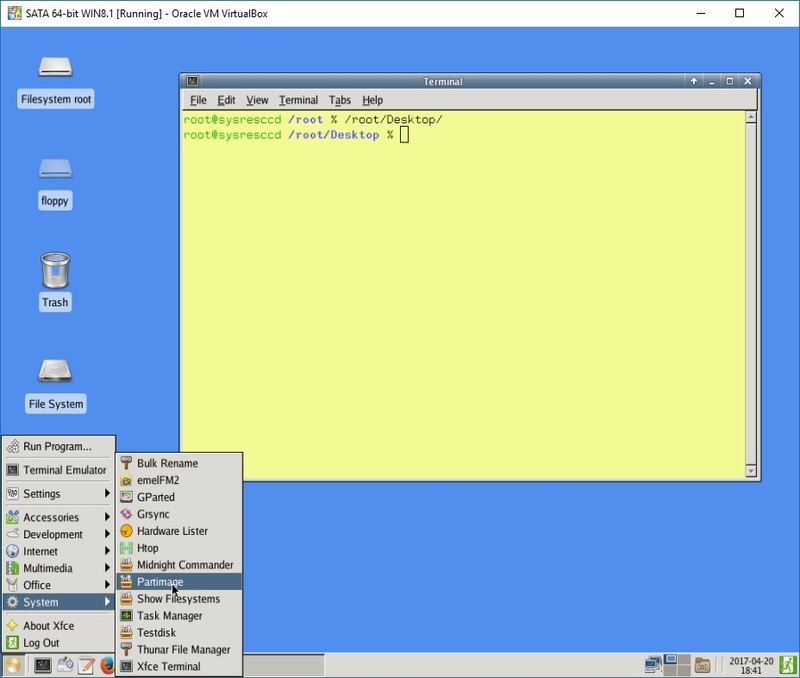 automatic menu building, QRUN feature, WIM and VHD booting, etc.) will no longer work unless a licence is found. Switch_E2B.exe, MakePartImage and UEFI-booting from .imgPTN files will not check for a licence however and will work as before.